2013 Auto-Sleeper Symbol: Tweaked to perfection? How do you make a popular high-top van conversion even more attractive? You take stuff out. Not quite literally, but in the case of Auto-Sleepers’ venerable Symbol, where there was a keenness to keep prices down but offer just as much as before when the 2013 version of one of its most successful models was introduced. And the first impression offers just one hint. Gone is the GRP roof. Instead, latest models use the same medium-wheelbase Boxer, but with Peugeot’s own high-roof – not as shapely, perhaps, but representing a significant cost saving. What has become a classic floorplan remains – behind the driver there’s an inward-facing settee (great for enjoying the views from when you’re parked up with the side door open), with a single rear travel set opposite; to the back there’s a generous kitchen along the offside and compact washroom nearside; all of which leaves space for access (and goods carrying) via the twin rear doors). Another slightly unusual offering is one you will do well to spot – all Symbols come with extra leaf springs for the rear suspension. In Auto-Sleepers’ own words, this stops the “slap” you associate with the rather hard ride of the standard Boxer base vehicle. Just to make the ride that bit more comfortable again, you get Al-Ko’s Airtop suspension aid with any Symbol that also includes the optional Premium Pack. Yes, it’s hard to imagine any new Symbol coming without this selection of goodies that extends to exterior fittings such as the wind-out awning, alloy wheels, colour-coded front bumper with LED running lights, awning, reversing camera, external gas barbecue, reversing camera and mud flaps. There’s more. 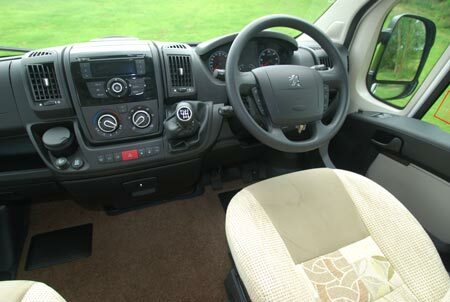 Inside, the Premium Pack continues with cab air conditioning and cruise control. There are plenty of more subtle changes throughout, too. 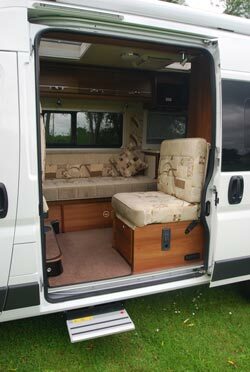 Like the additional mains socket that means you can use certain items outside under the awning, the almost imperceptibly softer foam for the lounge seating, the crockery set in a soft bag, etc etc. It still leaves a fair bit of choice. For example, you can have any of four metallic paint finishes, at no extra cost (in addition to the plain white of the model featured here). And there are five upholsteries available. Plus, there’s every chance an alternative two-tone wood finish for the furniture might be offered. There are plenty of other features to admire here, too. The underslung gas tank is a great example – not just freeing up valuable locker space but also meaning your gas refills cost considerably less. When it comes to bedmaking, you’ll need to be ready with your tape measure. 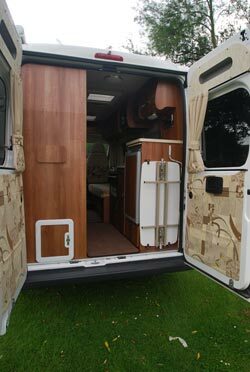 The easiest set-up is two single beds, but be warned – although the longer one stretches to 6ft 5in, the shorter one is just that, at 5ft 8in. You could always make a double, which comes in at 5ft11in x 5ft 8in. 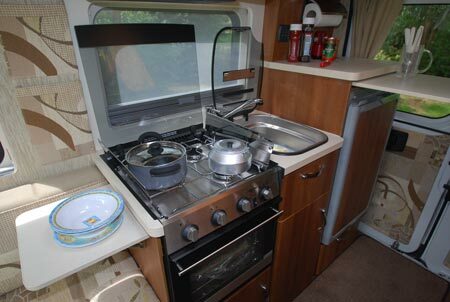 Something of a joy (especially by van conversion standards), the kitchen is fully specified (right up to a microwave oven) and the washroom – admittedly not large – is just about adequate for emergencies, ie when the campsite facilities aren’t quite up to expectations). Prices? A “realistic” £47,495, which would include that Premium Pack, means it doesn’t come cheap. 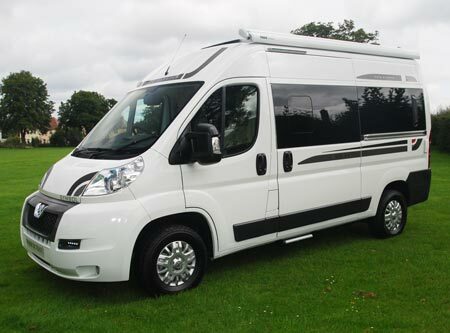 But, aside from a well-made all-round vehicle you’ll be getting one that wants for almost nothing in terms of specification… and is already set to maintain an Auto-Sleeper theme of maintaining its price better than all of its rivals. Plus: Highly equipped. Premium Pack. Longer term residuals. Can you please advise how the water is heated? Dual fuel gas/electric ? or gas only ? I can certainly try and find out for you Ron. Will get back to you when I know more.